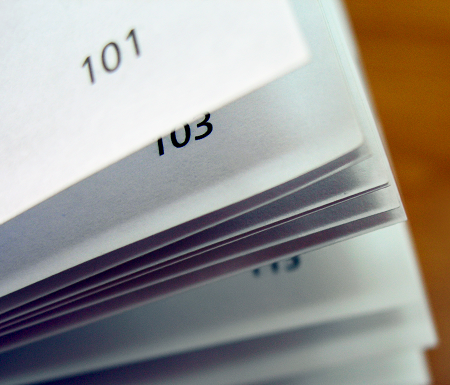 When it comes to adding page numbers to a book’s content, there are few absolute rules. 1) Make sure odd and even page numbers are placed correctly. When a book is opened, pages on the right hand side (known as recto) should always have an odd page number (1, 67, 213)…whereas pages on the left hand side (known as verso) should always have an even page number (2, 68, 214). Not adhering to this standard will have a negative impact on the appearance of the book. 2) Do not place page numbers near the inside margin. You might be surprised how often we receive book artwork files that, if printed, would incorrectly place page numbers near the inside margin…making them very awkward to reference because they would print close to the book’s spine. Always review your artwork file before submission to make sure all page numbers are properly placed. Page numbers should either appear near the outer margin of the page (in the lower or upper corner) or be centered at the bottom or top of the page. 3) There is no need to add numbers to blank pages. It is common for there to be some blank pages within the main body of a book. Since new chapters and sections should begin on the right side of an open book, the page to the immediate left is sometimes blank. Even though these blank pages are included in the book’s page numbering sequence, they do not need to receive a printed page number. For example, let’s say page 40 is completely blank. The page before it would be numbered as page 39 and the page after it would be numbered as page 41. Page 40 still counts as a page, but it doesn’t need a printed number. 4) Front matter should not be included in the book’s main pagination. Certain pages, such as the Copyright page, Dedication, Forward, Table of Contents, and so forth will appear before the book’s core content. These pages should not be included in the book’s main numbering sequence (1, 2, 3, 4, etc.). Instead, these pages are traditionally labeled with small Roman numerals (i, ii, iii, iv, etc.) or not numbered at all. 5) Don’t put the page numbers too close to the edge of the paper. Depending on the production method, the pages of your book may be printed on large sheets and then trimmed down to your desired page size. So, it is imperative to place the page numbers well inside the trim lines. Otherwise the numbers could end up too close to a trimmed edge, which will disrupt the aesthetics of the page layout. For best appearance, try to aim for a minimum distance of 3/8” from the edge of the page. Formax specializes in softcover book printing. We offer digital and offset printing, with a variety of finishing and bindery options. Whether you need perfect bound books, saddle-stitched books, spiral bound books or wire-o bound books, give us a call at 866-367-6221 to discuss your upcoming project. We’ll be happy to explain all your options as well as share some money-saving ideas with you. If you already know your specs, simply click here to submit our easy quote request form.